I’ve completed the initial build of my coupled 59cm Rivendell Bleriot, following the installation of couplers and a change in color to metallic light olive, all by Bilenky in Philadelphia. Comments encouraged! I installed my usual eclectic non-gruppo: Shimano XT/Synergy 36-spoke wheels from Peter White, XTR rear derailleur, Campagnolo Racing Triple 30-40-50 cranks with matching front derailleur, 8-speed bar end shifters, 12-32 XTR rear cogset, Nitto Technomic standard stem, Nitto Noodle bars, Brooks B-17, and to weird things up, a black (gasp!) 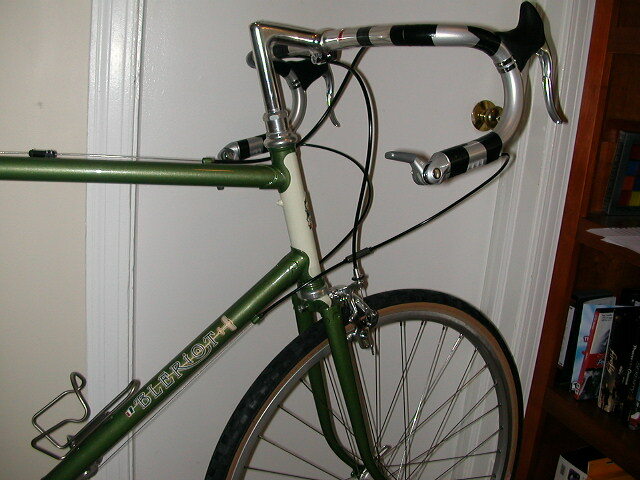 Ritchey seatpost. Brakes are Tektro 556. Headset is a Stronglight A9. Tires are Nifty Swifty. Fenders will be SKS silver, mostly for ease of removal and packing. 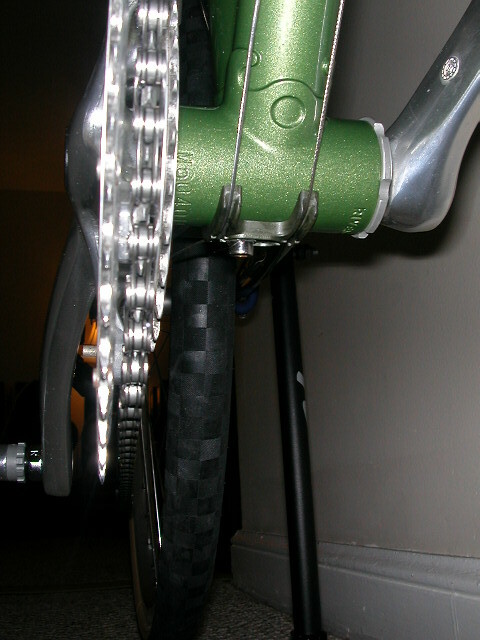 I know the Campy cranks are not perfectly practical, but they are pretty and meet my need for a pinch of Italian flavor. Everything went together nicely, except for the brakes. I think having toe-in on dual pivots is useless, in that I’ve never needed it on any of the Shimano’s I’ve used over the years. My New Bleriot. The color turned out nicely. The rear half. Pretend that seatpost is silver! At least it goes with the Gilles Berthoud bag. Peter White wheels, XTR. A perfect match? Yes, it’s true. An actual nylon cable guide. I had Bilenky grind off the cable guides on the shell and tap it for a guide. Looks great, Ed. What explanation can you offer for the black seatpost? Nitto on order? Is that a 59 cm? I had it in my parts box. I’ll get a Nitto next time I put in an order from Riv. Then again, maybe not! As a travel bike I’m not going to worry too much about the parts. The Ritchey is super adjustable, lots of setback and it’s light. The bicycle is GORGEOUS! The nylon cable guide is inspired; wish I’d thought to ask Bilenky to do that. I’d say let me know how the packing it up goes, but it appears we are traveling at the same time. I’ve got the Honjo fenders to deal with; should be interesting. I went for the telescoping handle side-pull S&S case. Thanks Lynne. I’ll post the first time I pack it up. 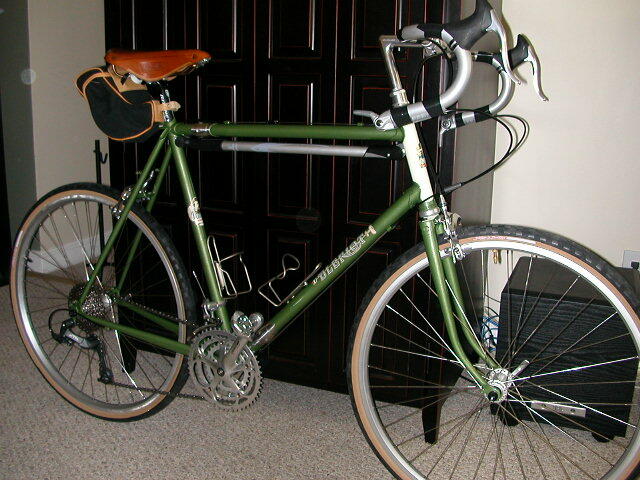 I have the silver S&S hard case, two came with our Co-Motion tandem. Beautiful! I like the green for a change…nice choice! Did you post the pics to the Bleriot Group? If not, please do, it would make a nice addition! Well happy traveling/riding! Nice! I like the colour much more than the original blue. Did Riv provide the new decals? 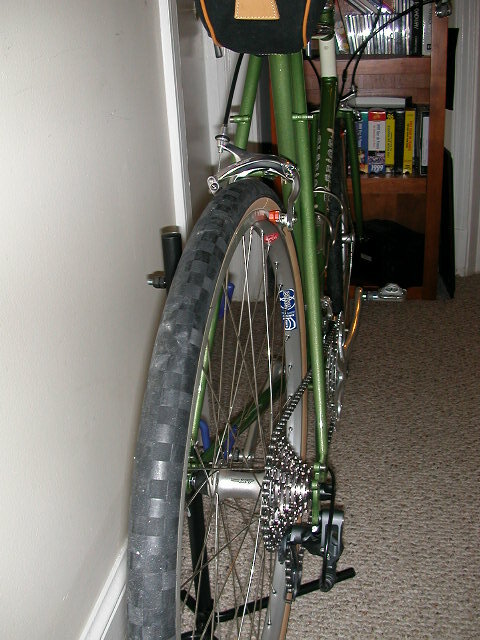 I would have had Bilenky add fork rack mounts and d/t shifter bosses while I was at it. Did you know that the Bleriot was originally planned to be a travel bike? See Riv Reader 28. Very approriate for a bike named after an aviator! Thanks. I thought about shifter bosses, but decided to leave well enough alone. I don’t use the bosses on my other bikes for shifters, only for adjuster stops. The decals are supplied by Riv to frame painters but not to customers; Bilenky acquired them directly from Riv. 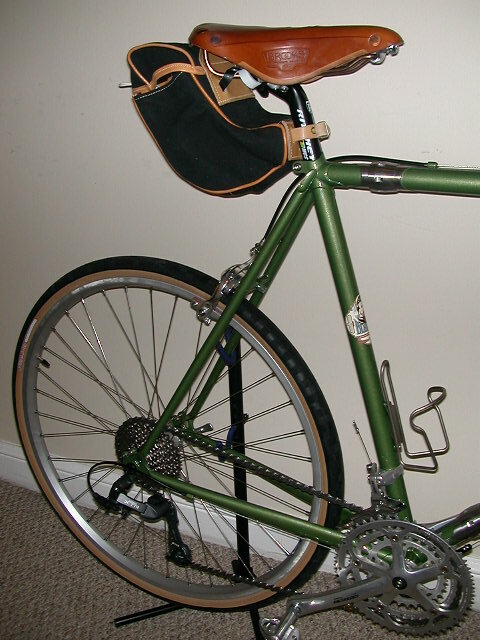 Fork rack mounts…I presume you mean not for low riders but for a front bag rack. I also thought about it too, but I prefer Carradice rear bags.